Doctors Deploy Shots And Drugs Against Whooping Cough Outbreak : Shots - Health News Some 338 people have been infected with whooping cough in Oregon this year. But that's just a small fraction of the number of cases the state of Washington is reporting. Health experts say the booster shot is not 100 percent effective at preventing the disease, but people who have it are far less likely to get sick. 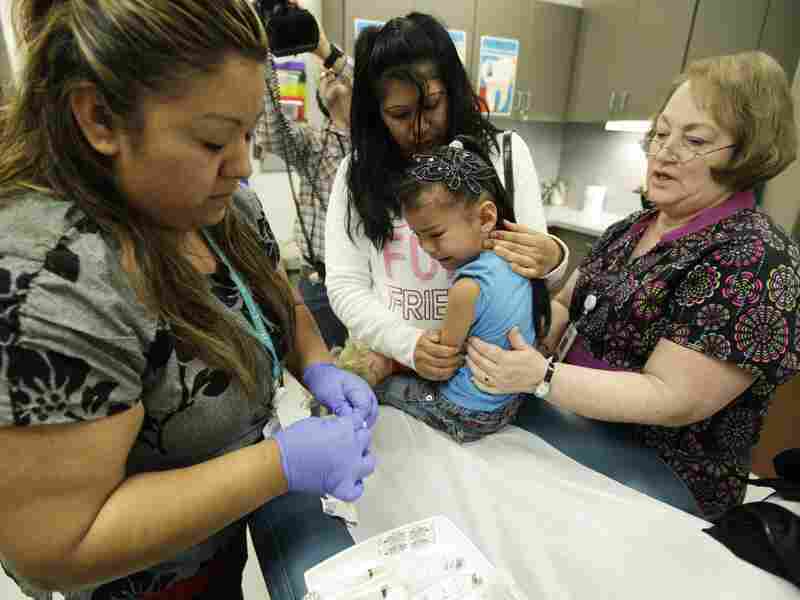 A nurse in Washington administers the whooping cough vaccine to a child in May. In response to the epidemic, more than 82,000 adults have also received the vaccine this year. A couple of weeks ago I got an e-mail from my son's middle school alerting families that several students had been diagnosed with whooping cough, also called pertussis. I didn't pay too much attention; my son has been vaccinated and he got a booster shot a couple of years ago so I hoped he would be protected. Then I started to cough. A visit to my doctor and a pertussis test confirmed that I am one of the 338 people infected with it in Oregon this year. That's three times higher than last year. Oregon's increase is nowhere near the number of cases the state of Washington is reporting. The Washington State Department of Health has declared a whooping cough epidemic and as of June 2 they've reported 2,092 cases. Still, public health officials in Oregon are trying to keep the outbreak from spreading. It's a highly contagious disease known for its long fits of uncontrollable coughing. In adults it's highly unpleasant, but in infants and young children it can cause serious respiratory problems and can be fatal, especially in babies less than a year old. As soon as I was diagnosed, my doctor put me on a five-day course of the antibiotic azithromycin and told me to stay home until I'd finished them. The antibiotics don't necessarily shorten the course of the illness but they do kill the bacteria so I won't spread it to anyone else. My husband and daughter, who were showing no symptoms, were also put on the antibiotic as a precaution and, because my son Max had started to cough, I took him in to get tested. Despite his vaccination and his booster shot Max's pertussis test was also positive. Both Washington and Oregon have seen an increase in pertussis (whooping cough) diagnoses in recent years. In 2002, the Washington State Department of Health reported fewer than 600 cases. During a 2005 outbreak, more than 1,000 cases were reported. The number fell below 300 in 2009, but climbed again to almost 1,000 cases in 2011. So far this year, 2,092 cases have been reported in that state. A similar trend was reported by the Oregon Health Authority: There were fewer than 200 cases in 2002, increasing to more than 600 per year from 2005 to 2007. Pertussis cases dropped to around 100 the following year, and steadily increased to 320 cases in 2011. As of June 2012, 338 cases have been reported in the state of Oregon – almost three times as many as were reported at the same time last year. Dr. Paul Cieslak, the medical director of the Oregon immunization program, says the booster is not 100 percent effective, but data shows people who have it are far less likely to get sick. In fact most of Oregon's current cases are in people who have never been vaccinated. Once there's an outbreak pertussis spreads quickly, Cieslak says. "One case in a susceptible group of people will cause many, many more cases. So it's pretty contagious probably because there's so much coughing going on and the bacterium is jumping out of your nose and throat with each cough," he says. Which is why it's important to get vaccinated, Cieslak says, to protect yourself from the disease and to stop spreading it to others. Health officials are recommending that everyone over the age of 11 get a booster shot. A big problem is many cases don't get diagnosed. For every case of whooping cough that is reported, Cieslak says there could be five, ten, even 20 cases that don't. "What that means is there are a lot of people walking around with it coughing, which is one of the reasons we are so set on covering your cough, coughing into your sleeve, and washing your hands," he says. "So you don't spread it even if you don't know you have it." In most adults the tell-tale "whoop" sound doesn't happen, that's only in young children who's airways are very small. In adults the cough is dry, hacking and long lasting — it's sometimes called the 100-day cough. So anyone with a persistent cough should get checked.